Edmonton's patient, practical and affordable driving school for learners of all ages. A GREAT EDMONTON DRIVING SCHOOL! 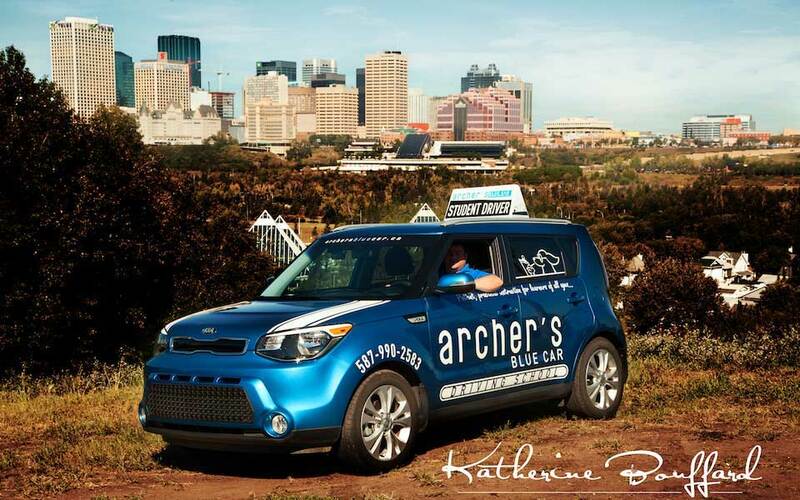 Archer’s Blue Car Driving School is a family-owned Class 5 driving school founded in 2012. Striving to offer the best driver education at affordable prices, we are quickly becoming one of Edmonton and St-Albert’s top driver training schools. Because of this, over 20% of our students are from referrals from previous students. (Which is amazing for a young driving school!) Our clients are thrilled with our professionalism, reliability, and our respectful approach to coaching new drivers. Many of the parents of our teenage students have said they wished we were around when their older kids had taken lessons. We primarily serve North-West Edmonton (downtown, U of A Area, West Edmonton) and St-Albert areas. We offer online and in-person driver training classroom session. Our in-person classroom sessions take part in the HP Center at NAIT College Main Campus near Kingsway Garden Mall. Book your lessons during weekdays and save! Next Classroom session April 27-28 at NAIT. At Archer’s we offer patient, practical instruction for learners of all ages! Our experienced provincially-licensed Class 5 driving instructors ensures that all lessons are conducted in a structured and progressive manner in order to create a safe and less stressful learning environment. We never have a student attempt any manoeuvres unless we think they’re ready for it. Excellent communicators, our instructors make sure that our students fully understand the what and why of what is required during their lessons. Our mission is to create safe, confident and independent drivers. For this reason the vast majority of our students pass their road test on their first attempt. We are the driving school that has the two new cool blue driver training cars with the dog in the window. Maybe you’ve noticed them around your own neighbourhood! Both of our main driving school cars are the same therefore our students don’t have to familiarize themselves with different cars during their lessons. If you would like to register for driver training with Archer’s Blue Car, please complete our online registration form. We are proud of our affordable prices for driver education in Edmonton! Feel free to peruse our price list. We have been responsive to our clients’ wishes for simplifying the driving lesson booking process. We recently introduced an online schedule for in-car lessons. Anyone can view the schedule but only registered driving school students are able to book. View our online driving lesson schedule. You may also want to see details on upcoming classroom times.